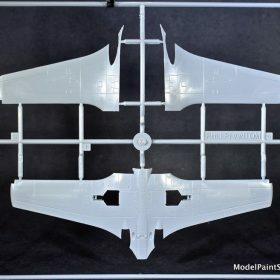 Unlike most of my reviews, which begin with my weekly pilgrimage to Skyway Model Shop, the “rescue” of this Special Hobby Phantom required 2-3 visits before I broke down. 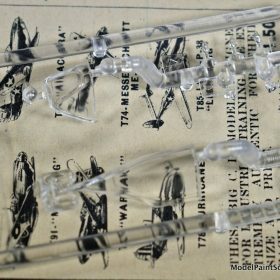 I resisted because, as it is, I’ll have to be somewhere around 467 years old to build all the kits in my stash. 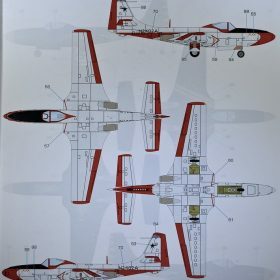 Of Course, it is an FH-1 Phantom and it is by one of my favorite model companies (Special Hobby) and there is an “R” in November. So, after “seeing reason,” the Phantom came home with me. I know you understand. 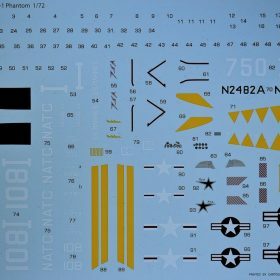 This is a nice kit with some awesome decal options. Keep ‘em coming, Special Hobby. Highly Recommended! The McDonnell FH Phantom was a twin-engine jet fighter designed and first flown during World War II for the United States Navy. The Phantom was the first purely jet-powered aircraft to land on an American aircraft carrier and the first jet deployed by the United States Marine Corps. Although with the end of the war, only 62 FH-1s were built, but it helped prove the viability of carrier-based jet fighters. As McDonnell’s first successful fighter, leading to the development of the follow-on F2H Banshee, which was one of the two most important naval jet fighters of the Korean War, it would also establish McDonnell as an important supplier of Naval aircraft. When McDonnell chose to bring the name back with the Mach 2–class McDonnell Douglas F-4 Phantom II, it launched what would become the most versatile and widely used western combat aircraft of the Vietnam War era: adopted by the USAF and the US Navy. In early 1943, aviation officials within the United States Navy were impressed with McDonnell’s audacious XP-67 Bat project. McDonnell was invited to cooperate in the development of a shipboard jet fighter using an engine from the turbojets then under development by the Westinghouse Electric Corporation. Three prototypes were ordered on 30 August 1943 and the designation XFD-1 was assigned. Under the 1922 United States Navy aircraft designation system, the letter “D” before the dash designated the aircraft’s manufacturer. The Douglas Aircraft Company had previously been assigned this letter, but the USN elected to reassign it to McDonnell because Douglas had not provided any fighters for naval service in years. 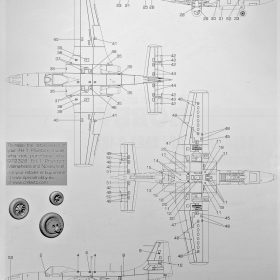 McDonnell engineers evaluated a number of engine combinations, varying from eight 9.5 in (24 cm) diameter engines down to two engines of 19inch (48 cm) diameter. The final design used the two 19 in (48 cm) engines after it was found to be the lightest and simplest configuration. 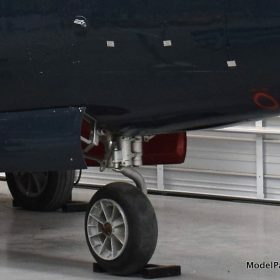 The engines were buried in the wing roots to keep intake and exhaust ducts short and offer greater aerodynamic efficiency than underwing nacelles. The engines were angled slightly outwards to protect the fuselage from the hot exhaust blast. Placement of the engines in the middle of the airframe allowed the cockpit with its bubble-style canopy to be placed ahead of the wing, providing the pilot excellent visibility in all directions. This engine location also freed up space under the nose allowing designers to use tricycle gear, thereby elevating the engine exhaust path and reducing the risk that the hot blast would damage aircraft carrier decks. The construction methods and aerodynamic design of the Phantom were fairly conventional for the time. The aircraft had unswept wings, a conventional empennage, and an aluminum monocoque structure with flush riveted aluminum skin. Folding wings were used to reduce the width of the aircraft for storage aboard ship. Provisions for four .50-caliber (12.7 mm) machine guns were made in the nose while racks for eight 5 in (127 mm) High Velocity Aircraft Rockets (HVAR) could be fitted under the wings, although these were seldom used in service. Adapting a jet to carrier use was a much greater challenge than producing a land-based fighter because of slower landing and takeoff speeds required on a small carrier deck. The Phantom used split flaps on both the folding and fixed wing sections to enhance low-speed landing performance, but no other high-lift devices were used. Provisions were also made for Rocket Assisted Take Off (RATO) bottles to improve takeoff performance. When the first XFD-1, serial number 48235, was completed in January 1945, only one Westinghouse 19XB-2B engine was available for installation. Ground runs and taxi tests were conducted with the single engine, and such was the confidence in the aircraft that the first flight on 26 January 1945 was made with only the one turbojet engine. During flight tests, the Phantom became the first naval aircraft to exceed 500 mph (434 kn, 805 kph). With successful completion of tests, a production contract was awarded on 7 March 1945 for 100 FD-1 aircraft. With the end of the war, the Phantom production contract was reduced to 30 aircraft, but was soon increased to 60. The first prototype was lost in a fatal crash on 1 November 1945, but the second and final Phantom prototype (serial number 48236) was completed early the next year and became the first purely jet-powered aircraft to operate from an American aircraft carrier, completing four successful takeoffs and landings on 21 July 1946, from Franklin D. Roosevelt near Norfolk, Virginia. At the time, she was the largest carrier serving with the U.S. Navy, allowing the aircraft to take off without assistance from a catapult. The second prototype crashed on 26 August 1946. 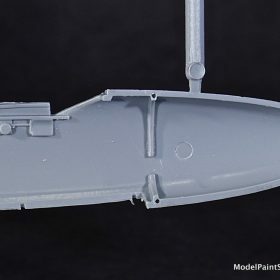 Production Phantoms incorporated a number of design improvements including provisions for a flush-fitting centerline drop tank, an improved gun sight, and speed brakes. Production models used Westinghouse J30-WE-20 engines with 1,600 lbf (7.1 kN) of thrust per engine. 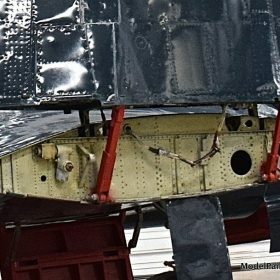 The top of the vertical tail had a more square shape than the rounder tail used on the prototypes and a smaller rudder was used to resolve problems with control surface clearance discovered during test flights. 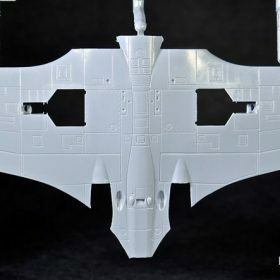 The horizontal tail surfaces were shortened slightly while the fuselage was stretched by 19 in (48 cm). 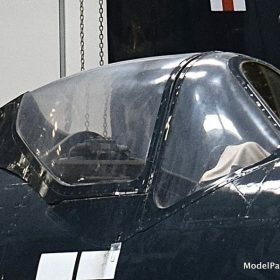 The amount of framing in the windshield was reduced to enhance pilot visibility. 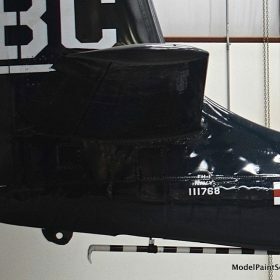 Halfway through the production run, the Navy reassigned the designation letter “D” back to Douglas, with the Phantom being re-designated FH-1. Including the two prototypes, a total of 62 Phantoms were finally produced, with the last FH-1 rolling off the assembly line in May 1948. 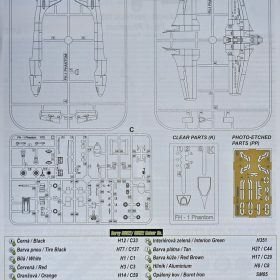 Realizing that the production of more powerful jet engines was imminent, McDonnell engineers proposed a more powerful variant of the Phantom while the original aircraft was still under development – a proposal that would lead to the design of the Phantom’s replacement, the F2H Banshee. 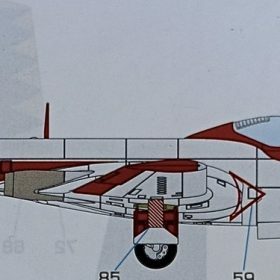 Although the new aircraft was originally envisioned as a modified Phantom, the need for heavier armament, greater internal fuel capacity, and other improvements led to a substantially heavier and bulkier aircraft that shared few parts with its agile predecessor. 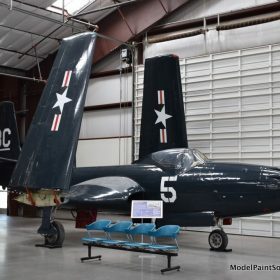 Despite this, the two aircraft were similar enough that McDonnell was able to complete its first F2H-1 in August 1948, a mere three months after the last FH-1 had rolled off the assembly line. The first Phantoms were delivered to USN fighter squadron VF-17A (later redesignated VF-171) in August 1947. The squadron received a full complement of 24 aircraft on 29 May 1948. Beginning in November 1947, Phantoms were delivered to United States Marine Corps squadron VMF-122, making it the first Marine Corp combat squadron to deploy jets. VF-17A became the USN’s first fully operational jet carrier squadron when it deployed aboard USS Saipan on 5 May 1948. The Phantom was one of the first jets used by the U.S. military for exhibition flying. Three Phantoms were used by the Naval Air Test Center as a unique demonstration team called the Gray Angels whose members consisted entirely of naval aviators holding the rank of Rear Admiral (Daniel V. Gallery, Apollo Soucek and Edgar A. Cruise.) 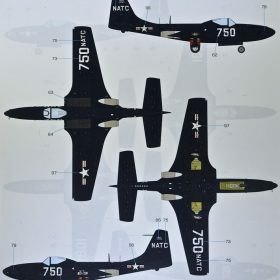 The team’s name was an obvious play on the name of the recently formed U.S. Navy Blue Angels, who were still flying propeller-powered Grumman F8F Bearcats at the time. The “Grays” flew in various air shows during the summer of 1947, but the team was abruptly disbanded after their poorly timed arrival at a September air show in Cleveland, Ohio, nearly caused a head-on low-altitude collision with a large formation of other aircraft. Their Phantoms were turned over to test squadron VX-3. The VMF-122 Phantoms were later used for air show demonstrations until they were taken out of service in 1949, with the team being known alternately as the Marine Phantoms or the Flying Leathernecks. 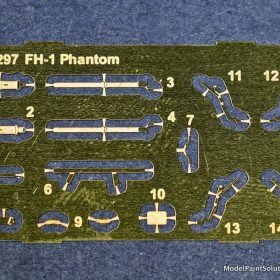 The Phantom’s service as a frontline fighter would be short-lived. 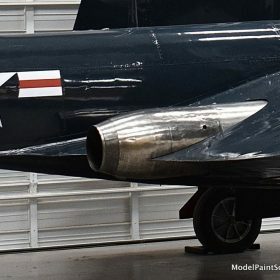 Its limited range and light armament – notably, its inability to carry bombs – made it best suited for duty as a point-defense interceptor aircraft. 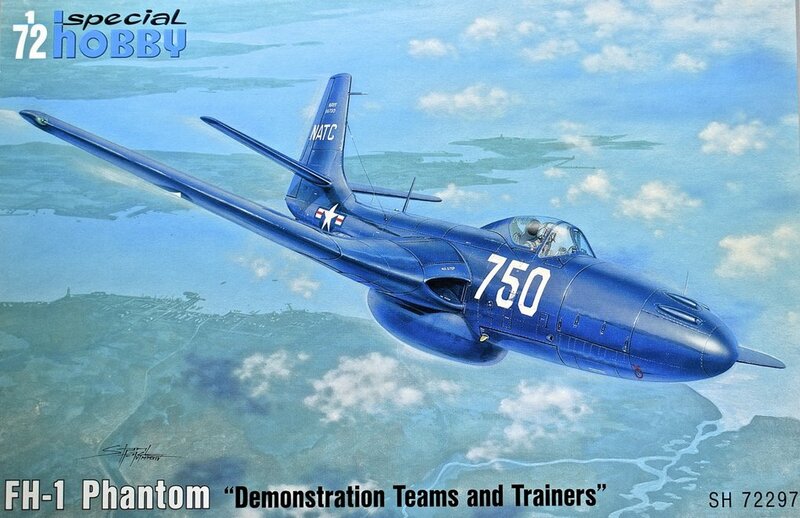 However, its speed and rate of climb were only slightly better than existing propeller-powered fighters and fell short of other contemporary jets, such as the Lockheed P-80 Shooting Star prompting concerns that the Phantom would be outmatched by future enemy jets it might soon face. Moreover, recent experience in World War II had demonstrated the value of Naval fighters that could double as fighter-bombers: a capability the Phantom lacked. Finally, the aircraft exhibited some design deficiencies: its navigational avionics were poor, it could not accommodate newly developed ejection seats, and the location of the machine guns in the upper nose caused pilots to be dazzled by muzzle flash. The F2H Banshee and Grumman F9F Panther, both of which began flight tests around the time of the Phantom’s entry into service, better satisfied the Navy’s desire for a versatile, long-range, high-performance jet. 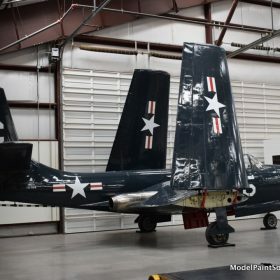 Consequently, the FH-1 saw little weapons training, and was primarily used for carrier qualifications to transition pilots from propeller-powered fighters to jets in preparation for flying the Panther or Banshee. In June 1949, VF-171 (VF-17A) transitioned to the Banshee and their Phantoms were turned over to VF-172. This squadron, along with the NATC, VX-3, and VMF-122, turned over their Phantoms to the United States Naval Reserve by late 1949 after receiving F2H-1 Banshees. 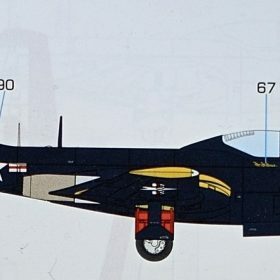 The FH-1 would see training duty with the USNR until being replaced by the F9F Panther in July 1954. No Phantoms ever saw combat, having been retired from frontline service prior to the outbreak of the Korean War. In 1964, Progressive Aero Inc. of Fort Lauderdale, FL purchased three surplus Phantoms, intending to use them to teach civilians to fly jets. A pair were stripped of military equipment and restored to flying condition, but the venture, and the aircraft, were soon retired. XFD-1: Prototype aircraft powered by 1,165 lbf (5.18 kN) Westinghouse 19XB-2B engines (J-30): two built. FH-1 (FD-1): Production version with 1,600 lbf (7.1 kN) Westinghouse J30-WE-20 engines (originally designated FD-1): 60 built. 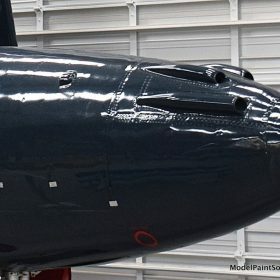 Pictures of the Phantom used with the gracious consent of the Pima Air Museum. If you’ve not visited Pima, it’s worth the trip but plan on a couple of days: you’ll need it. 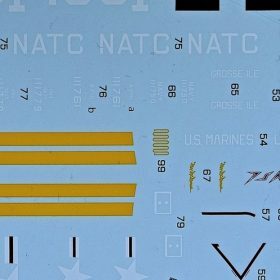 The kit comes in a sturdy, lidded box adorned with a nice, artistic picture of a blue US Navy Phantom. 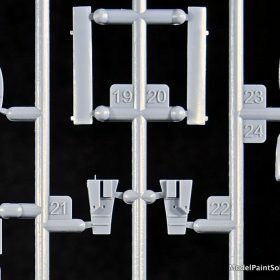 Inside are three sprues of light grey styrene and one of clear that exude crisp, clean molding on par with any mainstream manufacturer. 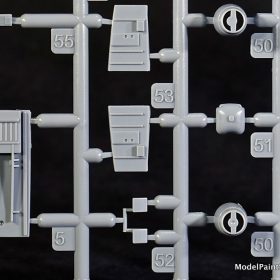 Readily apparent is the surprisingly low parts parts count and the fidelity with which the inscribed details are rendered: even on the smallest of parts. This is a very well done piece of work. Construction begins, as usual, with the cockpit comprised of a nicely molded, two-piece seat augmented with a PE harness. 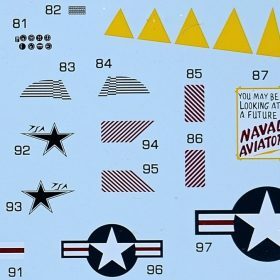 A well-printed decal is supplied for the instrument panel. Individual side consoles complete with PE handles, and rudder pedals complete the assembly. 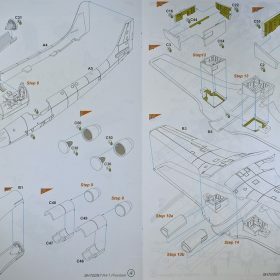 The cockpit assembly is then trapped between the fuselage halves that have additional cockpit details rendered in relief. 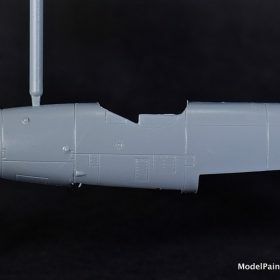 As with the 1/1 scale FH-1, there’s a lot of empennage hanging behind the main gear making the model a tail-sitter for sure. To address this, the instructions recommend placing 3g of weight in the nose: a very good idea. 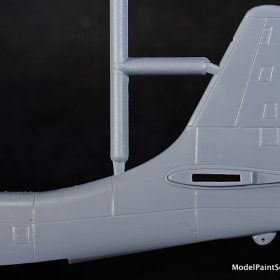 The nicely molded engine nacelles that protrude from the trailing edge of each wing are assembled next along with the multi-part main wheel wells. 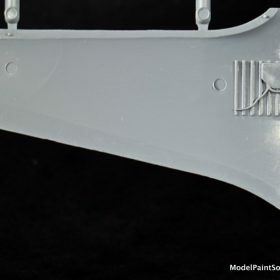 The wheel well parts will look great under paint and a wash to bring out the crisply molded details. 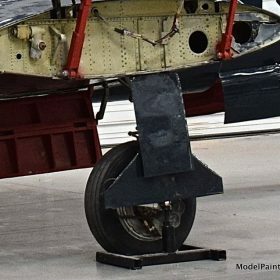 The wheel well assemblies and intake trunks are then trapped between the full span single-piece, lower wing and the left and right upper wing halves. 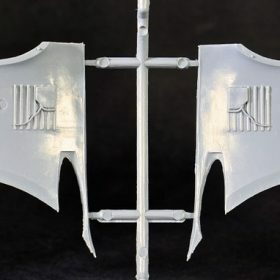 The inscribed surface details on the ventral wing surface are beautifully done. 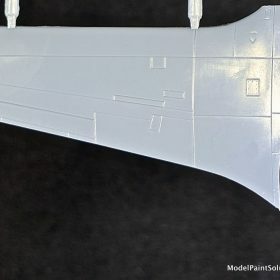 The wing is then offered up to the fuselage and with the addition of the leading edge intakes, major assembly is complete. 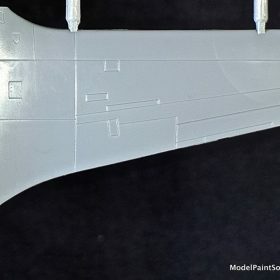 Next in sequence is the landing gear and here too, details are crisply molded; especially the 2-piece main gear oleo links. 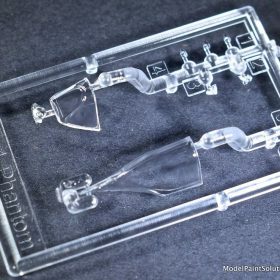 The clear parts are clear and nicely molded with scale-appropriate canopy frames. Two PE rear-view mirrors are provided for those with abnormally good vision or magnifiers. 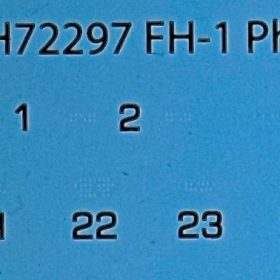 1) FH-1 Phantom, 750 (Bu.No. 111750) NATC (Naval Air Test Center), Naval Air Station, Patuxent, River. 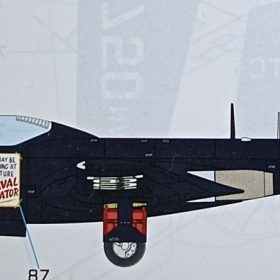 2) FH-1 Phantom, 108 (Bu.No. 111779) Naval Air Reserve, Naval Air Station, Grosse Ile, 1951. 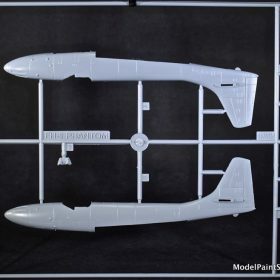 3) FH-1 Phantom, 108 (A-FH-1, Bu.No. 111761), Marine Aerobatic Display Team (unofficial name: The Flying Leathernecks), VMF-122, US Marine Corp, National Air Races, Cleveland, Ohio, 1949. Pilot: 1st Lt. “Mac” McManus. 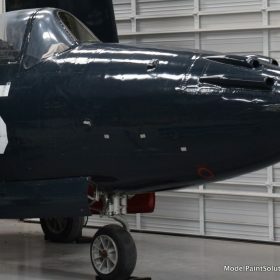 4) FH-1 Phantom, N2482A (Bu.No. 111769), Aircraft used for civilian jet training at the Teterboro School of Aviation, 1960’s. 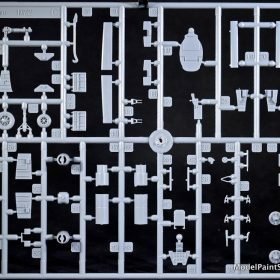 This is a beautiful kit that will easily build into a very nice model. 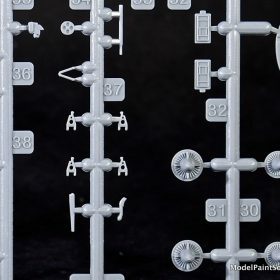 The details are clean and crisp, the decals are by Cartograph, and the subject is a lesser-known aircraft that’s deserved a new injection molded kit for a long time. Highly Recommended! 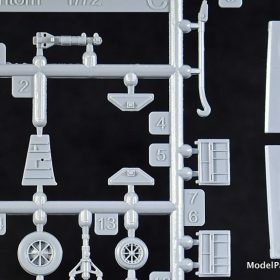 Kit eagerly purchased by reviewer……….again.